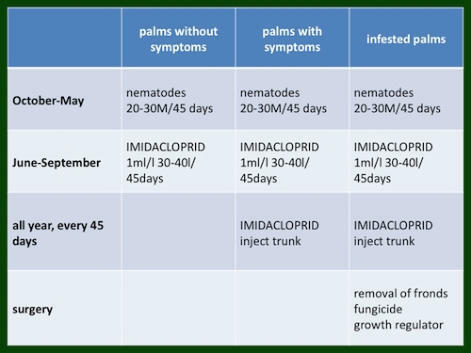 Research reports are showing that the use of Steinernema carpocapse nematodes are achieving cure rates of infected palms of 85% as a cure and 92% as prevention (A. Martinez Peña). It is applied by mixing the live nematodes in water (they are too small to be seen by the naked eye) and spraying between 5-10 million nematodes on a small palm and 20-30 million on a large palm. A well known bio research company is supplying this treatment in Spain in 6 package sizes. Information on this companies products can be found here. This particular product is supplied with a biostimulation product that stimulates growth in the palm to help it overcome the damage caused by Picudo Roco (otherwise known as Red Palm Weevil) . I have used these and they work. The only down side is once the vermin are eradicated the nematodes have nothing to eat hence they die. This leaves the palm open to re infestation. 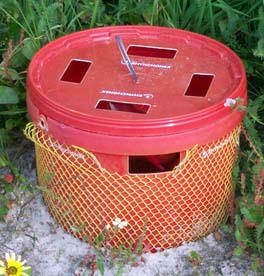 Pheromone Traps The trap is a bucket which contains water in the bottom (I add a little insecticide in the water to kill them quickly). Above the water and under the lid are two sachets suspended from the underside of the lid. One sachet containing pheromones and the other kairomones to lure the weevil into the bucket and die in the water. The side of the bucket has a plastic weave to give it the feel of palm bark for the weevil to climb on. One bucket covers an area between 50-100 meters and the sachets require changing every 90 days. 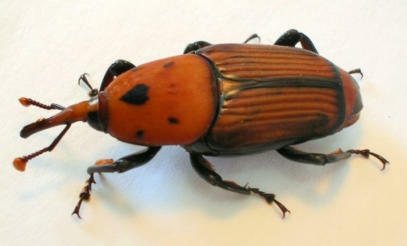 From personal experience I have found these to work but they appear to attract more beetle to the trees, and the beetles that miss the trap hit the tree. Information can be found here on this product.